This vignette represents Arthur Wellesley Duke of WellingtonHe is the Commander in Chief of the Allied Army at Waterloo. 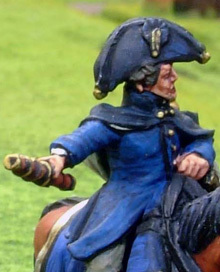 The figures are Perry with the dismounted officer being a conversion from a French officer. I have based the Duke on a large hexagonal base of 3mm ply. NOT APPROVED TO SELL BLB! I took great pains to set up a small network of motivated agents to sell BLB through various channels. Web sales are done through this site, shows are handled in the UK by Chiltern Miniatures, Under the Bed Enterprises and Musketeer Miniatures. Shops are supplied via North Star, Asia-Pac is handled by Eureka and the US by two independent book stores. In order to allow everyone a fair chance at some RoI it was decided not to 'flood' the market by hawking the product around everyone to see if I could unload a few copies here and there. This devalues the product, minimises profit and encourages discounting. Partizan Press have obtained a very small quantity of copies of BLB against my wishes and are now selling them on the net. I would encourage you to draw your own conclusions.